Madonna with one of her adopted daughters. "I hadn't held children before in my life. I was always considered so dark and I thought maybe I shouldn't be someone's mom because I'm not so sure about myself - am I going to be the best mom?" "The fact that this little kid seemed so at ease gave me the courage to feel I could make him happy and so we became a family." Jolie has two other adopted children with her partner Brad Pitt - Pax, three, from Vietnam; and Zahara, two, from Ethiopia - as well as their own biological daughter, 19-month-old Shiloh. A location of Cambodia on the world map. A Cambodian girl who disappeared aged eight has been found after living wild in the jungle for 19 years, police say. The girl is believed to be Rochom P'ngieng, who disappeared while tending buffalo on the edge of the jungle in remote northern Rattanakiri province. Her father says he has identified her through scars and will have DNA tests taken to prove she is his daughter. But the BBC's Guy De Launey in Phnom Penh says there are other possibilities to her identity. Members of Vietnamese hill tribes often cross into Cambodia through the jungles, he says. Many are seeking asylum from religious persecution and are keen to avoid contact with the authorities, he adds. Local police said the woman was "half-human and half-animal" and could not speak any intelligible language. Her plight came to light when a villager noticed some of his food had been taken and staked out the area, which is 350km (220 miles) north-east of Phnom Penh. "She was shaking and picking up grains of rice from the ground to eat"
Sal Lou, the father said. Deputy provincial police chief Chea Bunthoeun told Associated Press news agency: "He spotted a naked human being, who looked like a jungle person, sneaking in to steal his rice." The villager and some friends then caught the woman. Sal Lou, a village policeman, said he recognised the woman as his daughter from a scar on her right arm. He said: "When I saw her, she was naked and walking in a bending-forward position like a monkey... She was bare bones. "She was shaking and picking up grains of rice from the ground to eat." Mr Sal Lou said the family was now watching her closely after she took her clothes off and suggested she would return to the jungle. Mout Iv gives a haircut Joe Khao in his barber shop. Mout Iv owns a barbershop in Olney. Chally Dang repairs copiers and fax machines. Hak Ouk works at a packaging company. The U.S. government brought them to Philadelphia as refugees from Cambodia's killing fields. Now, two decades or more later, the U.S. government is threatening to deport them back - for what they did, and didn't do, here in America. For Mout and Chally, both of whom arrived in the United States as children, Cambodia is a land they scarcely know or understand. For Hak, a generation older, Cambodia is the graveyard for his family, killed in the genocide. This is a story about responsibility and obligation - theirs, and the government's. With immigrants pouring into the United States, legal and illegal, it is also a cautionary tale about what happens to those from desperately poor countries who grow up in America's toughest city neighborhoods, isolated, desperate and confused. The government's initiation of deportation proceedings against Cambodian refugees is but the latest painful chapter in America's long and tragic involvement in Southeast Asia, beginning in the 1960s with the Vietnam War. As refugees, the Cambodians were eligible for citizenship after five years in the United States - but two-thirds have not become citizens. Thus, they remain subject to deportation laws if they commit crimes. To date, 169 Cambodian refugees - including at least three from Philadelphia - have been deported since Cambodia signed a treaty with the fixUnited States in 2002, agreeing to accept those still legally its citizens. It was one of the last countries in the world to do so. In Philadelphia's Cambodian community, the fourthcq-largest in America, the government's policy of deporting refugees with criminal records has become highly controversial, given America's role in destabilizing Cambodia and the hardships those refugees have faced since their arrival. "They feel like they've been betrayed their whole lives," said Helly Lee, an advocate with the Southeast Asia Resource Action Center. "Coming here and being thrown in ghettos, and being in that cycle of poverty - and then to be sent back to a country they don't know." Pat Reilly, an Immigration and Customs Enforcement spokeswoman, responded that U.S. law requires, without exception, the deportation of immigrants who commit crimes. "We just enforce the laws that are on the books," she said, "and there is no special status for refugees." Mout, Chally and Hak don't pretend to be choirboys. Mout, 30, and Chally, 25, take full responsibility for gang-related assaults they took part in when they were much younger. Hak, 58, deeply regrets that night in February 2000 when he lost his cool at a Philadelphia Parking Authority impoundment lot and fired a gun in the air. But their biggest mistake, it turns out, was what they didn't do: They never sought to become citizens. "It's always in the back of your mind, to be a citizen," Mout said, "but the streets had me." Should they now be subject to the same deportation proceedings as economic immigrants? Leaders and advocates in the Cambodian community believe the U.S. government has a special obligation to those who came here as refugees. The Maoist-inspired fixKhmer Rouge regime emptied the cities, set up work camps, and killed as many as two million people in a geopolitical nightmare that the United States helped create. They also wonder whether more could and should have been done to help Cambodian refugees navigate the citizenship process. The fact that so many Cambodians living here have not become citizens, they say, is evidence of the community's isolation, ignorance of the law, or fear of authority. "Resources weren't available to help with the integration process. There was a lot of shock," Lee said. "Just surviving was totally different than what they were used to." A dream deferred If Mout had become a citizen, he would be considered a success story - someone who turned his life around in prison. Like Mout, most of those facing deportation were children when they were brought here and thrown into an urban cauldron. For Mout, born in 1977, Cambodia has existed only in hazy, painful memories of early childhood. Raised in the United States from the age of 9, he knows more about hip-hop and the Phillies than fixKhmer society and culture. His old-school barbershop, at Front and Champlost Streets in Olney, is a shrine to Philadelphia sports: Flyers calendars and Sixers foam fingers, Phillies bobbleheads and framed front pages from the Eagles' last Super Bowl. Standing at a barber chair, his clippers gliding through a customer's hair, Mout reflected on the path he had taken, from a sick child whose mother carried him through the Cambodian jungle to escape war and atrocity, to a homeowner and proprietor with a loyal clientele. "I'm living the American dream," he said. Mout can't quite believe that he owns a home and a business, just 31/2 years after getting out of prison. He gives all the credit to God. "I went astray, but he let me go. Just like the parable of the . . .," he said, momentarily distracted. "The prodigal son," his customer said. It was in 1998, the day after his 21st birthday, that Mout and some friends robbed a man in Olney. Mout served more than four years in state prison and then was held in federal immigration detention for a year pending deportation. He was set free in January 2004 under supervision, and has been waiting ever since for the Cambodian government to process his deportation papers. Mout doesn't know when Cambodia will be ready. For now, he lives in the moment. Every six months he must report to the U.S. Citizenship and Immigration Services at 16th and Callowhill Streets. "I'm scared to death when I go in there because you don't know if you're going to get out," he said. "But I go because I have faith in the Lord. . . . If it happens, it happens for a reason." Surviving the streets The 2000 U.S. census estimated the city's Cambodian population at 6,570 people, although the Cambodian Association of Greater Philadelphia insists the number is three times that many. While there have been many individual success stories, others in the community have been left isolated and needy because of poverty, lack of education, mental illness or language difficulties. "Basically they knew how to survive in the jungle," said Rorng Sorn, an advocate at the Cambodian Association. "A lot of them, when they came into the city, they had a hard time adapting to the lifestyle." For the children, often raising themselves, the lure of the streets was strong. Chally, Mout's cousin, has never even set foot in Cambodia. Born in 1982 in a refugee camp in Thailand, he was an infant when his family was resettled in what he describes as a roach- and rat-infested apartment in Logan. "Stuck us right in the 'hood," he said. "Programs that helped get us on our feet? Welfare, and not much else." His mother was still traumatized by her experience in Cambodia's killing fields. Once in Philadelphia, she fought the ghosts of the past and found solace in drink. With such a depressed parent, Chally ran the streets, joined a gang of Asian kids, and got arrested for burglary for the first time at age 10. "If you're with other Cambodians, they understand you," he explained. "You can relate to each other. 'Oh, you were a refugee? I'm a refugee.' "
In 1997, when he was 15, Chally was involved in two shootings, one of them a drive-by in which he fired at a rival gang. He was arrested that year and tried as an adult for aggravated assault. He served more than five years, then did six months of detention in Immigration Court in York, Pa.
Chally, using the jail law library, won his freedom by citing a 1996 Supreme Court decision that said deportable immigrants cannot be held indefinitely if their home countries can't take them back. The court placed a six-month limit on detention. In prison, Chally picked up vocational skills and now works as a digital tech, repairing copiers and other office electronics. He has, he said, left his old ways behind. No matter. Chally could now lose contact with his three children, all younger than 3, if he gets deported. "I really want to be around until the kids get to an age that I can explain to them the way things are, the way things will be," he said. "I don't want them to be at an age when they don't understand. . . . 'Why is Daddy in another country? Does Daddy love me?' "
Defiance, resignation Unlike Mout and Chally, Hak grew up in Cambodia. As a young man, he served in the army under Prime Minister Lon Nol, a U.S. ally. Lon Nol sent about 500 troops, including Hak, to fight in Vietnam alongside the Americans. During the Vietnam War, the United States destabilized Cambodia with a massive bombing campaign that was aimed at North Vietnamese troops, but killed and displaced thousands of civilians. The U.S. government also supported a coup by a more pro-American regime. Historians believe both actions aided the rise of the Khmer Rouge, whose crimes the United States then largely ignored. When the Khmer Rouge took control of Cambodia and killed his mother and eight of his siblings, Hak made his way to a refugee camp in Thailand - and then to Philadelphia in 1976 as a refugee. "I no want to come here," he said, "but you bring me here. My whole family die in Cambodia, and now I have family here. And you try to send me back?" Hak soon became a leader of his community, helping neighbors and coworkers. He has children nearly the same age as Chally, all educated in Philadelphia's Catholic schools. But all of his good deeds and hard work have been overshadowed by what happened one night in February 2000 at a Philadelphia Parking Authority lot near Oregon Avenue. Hak, working as a tow-truck driver, got into a fight over a friend's car and was beaten by another driver, he said. Hak said after he had tried in vain to get a police officer to intercede, he returned with an unregistered .45-caliber Beretta and fired two shots. Hak insisted he had fired in the air. The other driver, who denied beating Hak, said Hak had fired at his truck. In the end, Hak served five months of house arrest for aggravated assault. Hak believes the United States, in seeking now to deport him, is being unfair. "I fought for the American Army for three years," he said. "I'm lucky I didn't die. If I didn't go to Vietnam War, I never come here, no way." In an interview at his South Philadelphia home, Hak alternated between defiance and resignation. "Two more years and I'll hit 60," he said at one point. "If they want to send me back, OK. I want to stay at least two, three more years, and OK."
He said he hoped he could see his youngest son, 17-year-old David, get his diploma. "That's what I tell my lawyer: 'Just help me until my three boys finish high school, then I go,' " Hak said. But while most returnees are troubled by the uncertainty and separation of deportation, Hak's fears run deeper. "I go to my town, maybe they kill me," he said. "My town all Khmer Rouge." 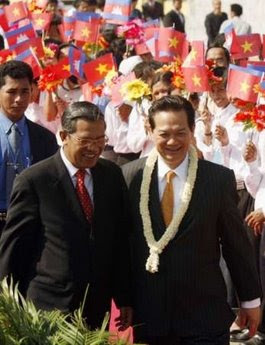 Picture: Hun Sen (left) and Vietnamese leader, Mr. Dung (right), during Dung's visit to Cambodia. It is due to such a visit which resulted in a close co-operation between the two countries. VietNamNet Bridge - Representatives from Cambodia’s Svay Rieng province and Vietnam’s Tay Ninh and Long An provinces have met to review their cooperation in maintaining border security in 2007 and work out a cooperation programme for 2008. Cheang Um, from Svay Rieng province, highly appreciated the cooperation of the two countries’ security forces in fighting crimes and maintaining security in the common border area, particularly in the fight against drug and human trafficking and preventing illegal immigration. “The three provinces effectively cooperated in dealing with violation of entry and exit regulations and of security and social order in the common border area of the three provinces,” the meeting agreed. The representatives discussed measures to promote cooperation and implement the plan to join hands to prevent crimes and ensure security in their common border area. Benny Widyono was talking by phone with his wife, Francisca, who was at home in Stamford, when a UN soldier screamed "get down!" Siem Reap, where the Indonesian diplomat served as provincial governor for the United Nations Transitional Authority in Cambodia - the peacekeeping mission deployed in 1992 after decades of civil war in the country - was under attack by the Khmer Rouge. "They were fighting us with 900 people," says Widyono, who called his wife from a phone inside UNTAC's Australian communications unit. "She was up all night worrying about me. "Before their ouster by the Vietnamese-led People's Republic of Kampuchea in 1979, the KR starved or executed some 2 million of their own people in a four-year campaign to force Cambodia's population into agrarian labor communes. Now 14 years later, they were shelling Widyono's city in protest of UNTAC-coordinated elections.Widyono admits he could have waited to call his wife. But, he says UNTAC "timidity" toward the KR - born out of a UN mandate recognizing the group as a legitimate administrative faction in Cambodia - gave them the audacity to strike in the first place. "How can you recognize a genocidal regime? Without UN recognition, the KR wouldn't have been as confident," says Widyono, who discusses his experiences as part of UNTAC from 1992-1993 and later, as a UN special envoy to Cambodia from 1994-1997, in his memoir, "Dancing in Shadows: Sihanouk, the Khmer Rouge and the United Nations in Cambodia. "As the title suggests, Widyono's narrative focuses on the role of what he calls the "unholy trinity" - King Norodom Sihanouk, the KR and the UN - in fomenting political chaos. Widyono writes how the UN refused to recognize the PRK, even though it freed Cambodia's citizens and worked to rehabilitate the country. Instead, it was slapped with economic sanctions (withholding aid for thousands) and denied representation at the UN.Those seats, Widyono says, were kept for representatives of the Sihanouk-led Coalition Government of Democratic Kampuchea - comprised of the KR and other anti-Vietnamese groups - at the behest of western nations like the United States. Rather than support Cambodia's de facto rulers or leave the UN seat open, Widyono explains, the West backed a powerless government in exile - all because the PRK was installed by Vietnam's communist government, a hated enemy of the United States in the Cold War. "It's like letting Hitler represent Germany at the UN," Widyono said during a Dec. 11 lecture at the University of Connecticut in Stamford, where he teaches economics. "Did anyone ask the Cambodian people who they wanted to represent them? "On the ground, this meant Widyono and his UNTAC colleagues could not disarm Cambodia's warring factions (the KR was non-compliant) or protect civilians from the KR's pre-election violence.Widyono says his comments have "raised eyebrows" at the UN, which views UNTAC as an overall success for its organization of elections and repatriation of refugees. He still believes UNTAC's mission was fundamentally flawed. "The Paris Peace agreements (ending the civil war) were born with original sin because UNTAC had to recognize the KR," says Widyono, who wrote the book during a three-year stint as a visiting scholar at the Kahin Center for Advanced Research in Southeast Asia at Cornell University. "Our mandate was a joke. "Oddly enough, Widyono didn't hear complaints from Cambodia's ostentatious King Sihanouk, whom he criticized for backing the KR. He was surprised to receive a thank-you note from Sihanouk for the copy of "Dancing..." he sent to the former king for his birthday. "I was quite critical of him, so I wasn't sure if he would like the book," says Widyono. "But he likes to have his name mentioned everywhere and my book revives him. He is even in the title. "Widyono may be firm in his criticisms of UNTAC and pessimistic about the UN, but he still thinks there can be lessons for future missions, such as the United Nations-African Union Hybrid Mission in Darfur. "The UN is constrained because they don't have their own troops," Widyono says. "But that doesn't mean they can't stand up to those who have committed atrocities." VietNamNet Bridge – The number of foreign travelers to bordering nations, Laos and Cambodia, are half those coming to Vietnam. However, international visitors’ complaints reveal that Vietnam has much to learn from its neighbors. Where has all the hospitality gone? A traveler nicknamed Eileen 76 on the Lonely Planet tourism forum, wrote: “My friends and I just got back from a five day trip to Hanoi, Vietnam and frankly, it was a trip from hell.Why? From the moment we stepped on the plane (AirAsia), you get ignorant and stubborn Vietnamese who turned on their mobiles mid-flight! Not one, but several, despite sterm reprimands from the stewardess. The next day, I had my mobile stolen from my backpack. We were standing on a sidewalk near the lake, trying to figure out which road we were on and where to go when I felt a tug from behind. I turned around and saw a guy standing too close to me. I yelled at him and my first reaction was to quickly check my bag to see whether my digicam and money were missing. Regarding service quality, Eileen wrote: “And what’s up with Hanoian’s attitude anyway? They’re rude, crude and uncouth. OK, so they don’t really speak English. Fine. I can accept that. What I can’t stomach is the way they don’t even look you in the eyes when you speak to them. There was this incident at the Water Puppet Theatre where we wanted 3 tickets for the 8.30pm show. The ticketing girl curtly said "no" but tore three tickets and gave them to us. We asked (politely) what does no mean – is it no, there are no more seats for the 8.30 show or no, you don’t have VND20,000 seats?? (There were two classes of seats - VND20,000 and VND40,000).She just mumbled No again and eventually figured out the tickets she sold us were VND40,000 for the 9.15pm show. We told her we wanted the cheaper seats and again, got the mumbled no. During the entire (one-sided) conversation, the girl was scribbling on some papers on her desk! And she didn’t even look up while we were trying to communicate!!! In the end we gave up and just gave her the money. But what happened if a person didn’t want tickets but just some information? We encountered the same sour-faced and negative attitude among merchants around the Old Quarter market area when we asked them to take some pictures. For example, we went out to sampled biahoi (the austere local beer halls). The restaurant owner’s smile turned sour and her attitude immediately changed for the worst when we asked 2 simple questions: 1. How much (a reasonable enough request); and 2. Can I take a picture? And let’s not forget the attitude of Hanoians in general. They either poke (if you’re lucky), shove or ram you aside if you happen to walk a little slower or disrupt their route. And what about their inability to queue? What’s worse is they think its their god-given right to cut queue? Is all this really necessary? And before all you guys take potshots at me, note that I’m an Asian and as polite as possible, with smiles and thank yous (in the local language) to the people I meet whenever I travel. I’ve been to a number of countries, from Asia to Europe and in all my travels, never have I experienced a colder, ruder or more selfish people than in Hanoi. What happened to the reputed Vietnamese hospitality touted by everyone? An Australian visitor, Harry Ledger, who lived in Vietnam for ten months, shared the same opinion. He wrote about his “hard” trip to Ha Long Bay on BBC. According to Ledger, a tour guide named Nguyen slept and snored the whole way from Hanoi to Ha Long, except for when he led visitors to a souvenir shop, which offered items for double Hanoi prices. At noon, Ledger’s group stopped to eat lunch at a restaurant located near a railway station. It was terrible with overdone and cold food like prisoner rations. But “superintendent” Nguyen told Ledger that he hadn’t acquired a taste for Asian food because he was a foreigner. Ledger wrote that he had lived in Asia for years, at least ten months in Vietnam and that lunch was the worst meal he had eaten here. “But I and other visitors knew that if we complained, nothing would change. Finally, we arrived at the wharf. I saw hundreds of cranky boats swarming, aimed at the tourists. And a rickety, double-deck, 45-seat boat was ours,” he wrote. In another article on BBC, Ledger related the desperation of another western visitor, Anna Skodvedt-Sundling, who wished for a quick end to her trans-Vietnam tour. This Swedish girl, 26, was among the increasing number of independent tourists traveling to Vietnam on a trans-Southeast Asia tour. The girl said she was disappointed. Everything becomes uninspiring and she only wanted to go to Laos quickly because each day she was forced to argue so often with merchants over being cheated out of money. She thinks Thailand is more hospitable and convenient. 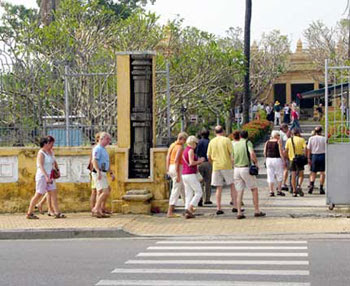 The above complaints are specifically aimed at tourist managers and Vietnamese locals. Picture: The beautiful pictures of Ros Serey Sothea during the peak of her musical career. Translated by Prum Seila (with some editing by Khmerization). If we read the book about the lives of famous Khmer Artists part one, which titled “Meas Srob Nokor” written by Seng Dara, we would have bumped into the story about the life of Ros Serey Sothea, Cambodia‘s most celebrated female singer. Mr Seng Dara devoted 73 pages, which is about half of this good book, to the life of Mrs. Ros Serey Sothea. Archived articles about the former singer Ros Serey Sothea describes about her personal life, whom the writer Seng Dara nick-named “Thida Mchas Koh Anlung Sne”( The Angel of the Island of Love). Ros Serey Sothea, who was a long time duet of Sin Sisamouth, the King of Khmer Pop, has left many musical legacies to this present day. From the life of a miserable girl who went around hawking and selling boilt snails to make a living in the 1960s, Mrs. Ros SereySothea had found fame and made her reputation shines in such a short time in the Khmer musical world. While her musical fame reached its peak, she was also a miserable woman in both her love life and her family life. Her childhood knew happiness so little, because her father, Ros Sabun, re-married and abandoned his wife and left his 5 children under the care of his step-wife. Serey Sothea had to go and catch snails everyday to sell in order to feed and raise her family. While she was selling her boilt snails, Mrs. Ros Serey Sothea was always singing the songs of Mrs. Keo Setha and Mao Sareth. The villagers from her village came to buy her snails everyday because they loved her singing, they have pity for her, and wanted to hear her beautiful voice. No one could ever thought that Ros Serey Sothea, the poor snail-seller from Battambang, could have become such a famous singer. One time, there was a Khmer new song contest in Battambang province. Serey Sothea didn’t dare to enter the contest. However, the villagers who knew about her beautiful voice, had encouraged and motivated her to enter the contest. Ms. Ros Serey Sothea entered the contest and won the first prize for the whole of Battambang province. After that, Ros Serey Sothea was invited to join Lomhea Yothea music band which was founded by Colonel Chay Lay. This music band was directed by Sok Dinary and Dy Kanal and this band regularly played at Stung Khiev Restaurant in Battambang town. Fortunately, one day an Ayai (a theatrical sing-a-song performance) band came to perform in Battambang and went to dine at Stung Khiev Restaurant. When they heard her voice, they were so overwhelmed with her beautiful and powerful voice. Mrs. Saram Park , the lead Ayai singer, invited Ros Serey Sothea to go with her to Phnom Penh. Some documents recorded that it was Mr. Im Song Serm who was the one who brought Sothea to sing in Phnom Penh. In Phnom Penh, Ros Serey Sothea became a singer for National Radio of the Ministry of Information. Please note that Mrs. Ros Serey Sothea became a singer after Mrs. Houy Meas. Afterward, Mrs. Ros Serey Sothea sang for the Mekong Pub, SolosSisSidorn Pub, Belair Pub of Pochengton. At that time, Sothea had made contacts with other singers who came from Battambang province and other provinces, such as Mr. Tol Penh, Mr. Sos Math, Mr. Meas Hok Seng, Mrs. Mao Sareth, Mrs. Pen Rorn, until she met Sin Sisamouth, the King of Golden Voice. From that time on, Ms. Ros Serey Sothea had devoted herself seriously to her musical career. From the beginning, Ros Serey Sothea didn’t sing as a duet with Sin Sisamouth just yet. She sang only with Im Song Serm, like the song called “Rong Chham Merl Teh Plov” (waiting for only your coming) “Khmao Euy Khmao” ( Oh! Dark Skinned girl). Ros Serey Sothea was increasingly becoming more famous day by day. She had such famous songwriters/poets as Mr. Pov Sipho, Mr. Voy Ho, as well as Mr. MalarTy (Mao Malapy?) to write the songs for her. Some songs were dual songs, that’s why she had a chance to sing with Mr. Sin Sisamouth. Since then her musical reputation became very well known throughout the country. Anyone who sang with Mr. Sin Sisamouth, the most famous singer in Cambodia, will be known to the king (Sihanouk). The King-Father (Sihanouk) liked Ros Serey Sothea very much, and bestowed upon her a special title of the “Queen of Golden Voice Ros Serey Sothea”. During the 1960s, Sothea’s very beautiful voice had hypnotised and mesmerised many Cambodian listeners. 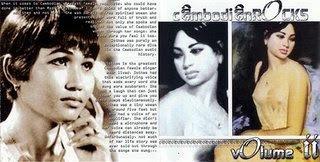 Many men wooed for her love, but the man who had successfully conquered her love was a famous Khmer Muslim singer Sos Math, nick-named “the beautiful voice of a bird”, who already had two wives and who was the singer of the melodious song “Pha-nhoe Kong Chong Dai” (Sending the bracelet for a wedding gift). When Sos Math married Ros Serey Sothea, he was still legally married to his two wives. Her marriage life with Sos Math was not a smooth married life and it had only lasted for 5 months before they split up. Ros Serey Sothea had suffered mental and physical punishment as she was a constant envy of both of his wives, as well as domestic violence from Sos Math himself. In order to escape her mental and physical agony, Ros Sereysothea fled to her native Battambang. Sin Sisamouth, who was her duet and who was very close to her, went to Battambang and convinced her to come back to Phnom Penh by vowing to protect her. Since then Mrs. Ros Serey Sothea continued her career as a singer in Phnom Penh till her death under the Khmer Rouge regime. The circumstances surrounding her death wasn’t clear. Some unconfirmed accounts said that the Khmer Rouge put her in charge of feeding and raising pigs and that she also sang for the Khmer Rouge. For some unknown reasons, in around 1977, she was taken away and executed. Note: alternative spellings: Ros Sereisothea, Ros Serei Sothea or Ross Serei Sothea. Ranariddh with ex-wife, Eng Marie, in the background. Cambodia's border issue with neighboring countries, especially with Vietnam and Thailand, continues to be a major worry for Cambodians of all political tendencies. 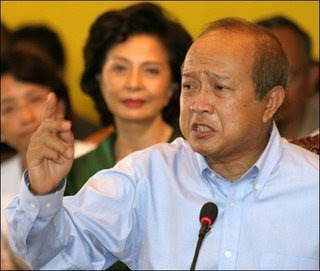 Concerning this vital problem of the country, the president of the Norodom Ranariddh Party [NRP] noted the inability of the current ruling party to resolve this border issue, saying that it is not able to settle the problem even with Thailand with which all the documents are already available.Prince Norodom Ranariddh reminded all Cambodians about the country's problems, such as the border problem with their neighbors. He said, "Cambodia must reexamine this problem if it does not want to become another Champa. "The prince referred to the motherland of the ethnic Cham people in present-day central Vietnam that was erased from the world map following its annexation by Vietnam.Because of the policy of Vietnamizing the Cham country, or Champa, the Cham who were the masters of their country have become a minority in their own motherland and have lost all opportunity to easily recover the freedom of their race.Prince Norodom Ranariddh talked about the danger facing Cambodia due to the policy of annexation pursued by the neighboring countries during a telephone conversation from abroad with the NRP leadership and activists in Phnom Penh a day before the International Human Rights Day during which he discussed Thailand's exploitation of the Cambodian leaders' situation and position of weakness.He said, "The settlement of the border problem with Thailand cannot be done by the Cambodian Government. I expect the Thais to set up their posts wherever Cambodia cannot reach. They have talked about the White Zone, something that never existed in the past. For example, they planted their new border markers in Otdar Meanchey province. "The prince talked about the problem concerning the planting of border markers with Vietnam, saying that it was done incorrectly.Prince Norodom Ranariddh said, "The planting of border markers with Vietnam was not right. "He said that although Cambodia made the supplementary law on 10 October 2005 to legitimize the law signed by Hun Sen with Vietnam on 25 December 1985 regarding the Cambodia-Vietnam border, the implementation of the border marker installation was not correctly done.To emphasize it, the prince noted that in 2006 when the first Cambodian-Vietnamese border markers were planted the ruling Cambodian People's Party [CPP] did not invite the representatives of the FUNCINPEC [National United Front for an Independent, Neutral, and Peaceful Cambodia] Party, which he then headed, to take part in any thorough inspection of the process of planting the markers. And because he kept publicly talking about this issue so that the Cambodian people would know about the incorrectness of the operation to plant the border markers between Cambodia and Vietnam, Hun Sen, prime minister and vice-president of the CPP, ordered Nhiek Bun Chhay to oust him from his post as the FUNCINPEC Party's executive president.Consequently, Nhiek Bun Chhay, Lu Laysreng, and their cronies staged a party coup on 18 October 2006 to overthrow Prince Norodom Ranariddh despite the fact that two days earlier His Majesty the Heroic King, founder of the FUNCINPEC resistance movement, issued a message affirming that he had handed full ownership of the FUNCINPEC Party to his august son, Samdech Krom Preah [royal title] Norodom Ranariddh.The president of the NRP also talked about the border problem, saying that His Majesty King Father Norodom Sihanouk prepared documents relating to the Cambodian territory of 181,035 square kilometers and deposited them in Vietnam [as received] during the Sangkum Reastr Niyum [Sihanouk's pre-1970 ruling party] regime.The prince also talked about the immigration issue, meaning the huge number of Vietnamese nationals who continue to pour into Cambodia without anything or anyone stopping them.The prince said that Cambodians cannot go in or out in a massive number as immigrants to neighboring Vietnam and Thailand like the Vietnamese nationals are pouring into Cambodia now.The prince talked about Cambodians going to neighboring countries surreptitiously, working as beggars in the cities of these countries, and regularly being arrested and deported by the governments of Vietnam and Thailand back to Cambodia.In addition to all of this, the prince pointed out the poverty of the Cambodian people under the leadership of the current government of Hun Sen's CPP.The prince said that in Cambodia of the times of Sangkum Reastr Niyum headed by His Majesty Norodom Sihanouk in the 1970s Cambodians lived a decent life and were not so poor as to be reduced to beggaring in neighboring countries.The leadership of the current government of Hun Sen's CPP, although the prime minister has boasted all along that he has been in power for more that 20 years now, has not been able to resolve the poverty problem affecting the Cambodian people. On the contrary, since the natural resources of the country and the country's national assets have fallen into the hands of the big shots that rely on their power and the rich who rely on their riches, these big shots and rich people have become ever richer while more and more Cambodians have become poor and the poor have become even poorer.Prince Norodom Ranariddh said that as a solution all democratic, royalist, and liberal parties should unite into a single party in response to the call of the people in order to win next year's election and jointly tackle all these problems of the nation. Khmer Rouge Tribunal building in Kambol, outside of Phnom Penh. More than three decades have passed since 1.7 million people died in the killing fields of Cambodia. Yet the U.N.-Cambodian tribunal has yet to bring those former leaders of the Khmer Rouge regime who are most responsible for the genocide to trial. The long-delayed tribunal faces numerous obstacles. Not least among them is the passage of time. Many Khmer Rouge leaders are either old or dead. Saloth Sar, better known as Pol Pot, died in 1998, a free man. Khieu Samphan, the Khmer Rouges’ former president, is 73 and recently suffered a stroke. Leng Sary, the Khmer’s former foreign minister is a frail 82, and Ta Mok, the regime’s former military chief, was hospitalized earlier this month. Among the youngest of those indicted to date is a 67-year-old known as Duch, who ran the notorious Tuol Sleng torture center in Phnom Pehn. Time is truly of the essence for the Extraordinary Chambers in the Courts of Cambodia, which seeks to provide some measure of accountability and justice for one of the most heinous of 20th century atrocities. But the tribunal’s future depends on the willingness of foreign donors to provide the assistance necessary to bring the five high-ranking former leaders of the Khmer Rouge now in detention on trial for crimes against humanity. A U.N. spokesman estimates that the tribunal, which has a budget of $56.3 million, will run out of funds in six months due to unanticipated costs. Recent U.N. reports have raised troubling questions about the tribunal’s administration, but many of the expenditures appear reasonable. For example, U.N. officials say the court needs to increase the number of translators to 40 from the current 14, and to create victim support and court transcription services. Tribunal officials will soon approach foreign donors — including the United States, which did not contribute to the original budget — with an urgent request for additional funding. Providing that the tribunal can produce evidence of progress and actions taken to fix problems identified in the U.N. reports, the United States should lead the way in providing the assistance needed to make certain justice is done in Cambodia. The international tribunals set up to deal with atrocities in Rwanda, the Balkans and Sierra Leone have proven to be expensive and imperfect instruments of justice. But they have served the profoundly necessary purpose of sending a message that justice, however delayed, awaits those who commit crimes against humanity. The U.N.-Cambodian tribunal deserves the full and timely support of the United States and the rest of the world. Webb reported from smack in the middle of everything. When Kate Webb reported from the battlefields of Cambodia, she kept her chestnut hair cropped G.I.-short and wore jeans and loose shirts to obscure her breasts. This was 1971. Only a handful of women were full-time correspondents in Vietnam, and even fewer women roughed the front lines next door in Cambodia, where military officers believed foreign women were, at best, a distraction. At worst, they were bad luck. Bad luck was a virus among foreign correspondents in Cambodia. Unlike in Vietnam — where Webb arrived four years earlier at age 23 with a philosophy degree, a one-way ticket from Australia, a Remington typewriter, $200 in cash and a whiskey-and-cigarette voice so soft people leaned in to hear her — there were no reliable phone lines in Cambodia to call your editor in an emergency. There were no American military hospitals to sew up your bullet wounds; no helicopters to evacuate you when things got bloody. By April 1971, several years before the Killing Fields, at least 16 foreign correspondents were missing and 9 were dead. On April 7, it was Webb’s turn. 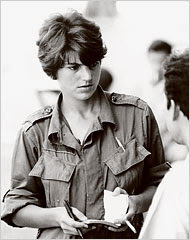 A 28-year-old bureau chief for United Press International, Webb was covering a clash on Highway 4, south of Phnom Penh. As bullets flew from every direction between North Vietnamese and United States-backed Cambodian troops, Webb and her Cambodian interpreter plunged into a ditch. By the time they eventually belly-crawled their way out, four other refugees from the attack had joined them: a Japanese photojournalist and his Cambodian interpreter along with a Cambodian newspaper cartoonist and a Cambodian photographer. Throughout that afternoon and night, the six of them crept through the wooded foothills of Cambodia’s Elephant Mountains, holding their breath as they stood within inches of chatting North Vietnamese soldiers. At 11:30 the next morning, tired, thirsty, their clothes and skin shredded by branches, they were crouching in the underbrush when they looked up to see two skinny North Vietnamese soldiers with AK-47’s. The soldiers bound Webb’s arms behind her back with wire, vine and tape and roped all of the captives together in a single line. They confiscated their notebooks, their ID cards, their cameras, their watches. Then they took one thing that Webb held dear: a gold Chinese charm that she wore around her neck. She had clung to that charm in foxholes and always came out alive. Now without it, she felt naked. After a soldier tossed her and other prisoners’ shoes into the trees, laughing, Webb was forced to walk barefoot on the hot asphalt and through woods littered with bamboo splinters and stones, until another soldier brought Webb a pair of thongs. She winced, knowing they had been stripped from a dead paratrooper. Following a week of night marches, they arrived at a military camp where Webb slept in a hammock and alternated between stretches of numbing boredom and piercing fear. Why, she wondered, hadn’t they shot her? Did they believe her during the interrogations when she said she wasn’t an American, wasn’t with the C.I.A., wasn’t a soldier? Maybe they would turn her over to the Khmer Rouge, where death — perhaps preceded by starvation — was almost certain. Maybe they planned to march her to the Hanoi Hilton, where United States pilots were being brutally tortured. There are worse things than a single bullet to the head. As Webb would later write in her memoirs, “On the Other Side: 23 Days With the Viet Cong,” there wasn’t all that much that separated soldier from prisoner. Both subsisted on two meals a day of rice and pork fat in a salted broth and wrestled with hunger, malaria, homesickness. Webb and a soldier she nicknamed Li’l Abner compared their scarred feet (his were worse) and, in French, discussed the Renaissance, the Reformation and the Napoleonic Wars. Three weeks into captivity, Webb had lost 25 pounds — down to 105, on her 5-foot-7-inch frame — and shook with fever from two strains of malaria. She longed to take a bath, to shave her legs, to eat an orange. She was not, however, dead. On April 21, 1971 — while Webb was sitting in the jungles of Cambodia — this newspaper ran her obituary. Near Highway 4, two Cambodian officers had found a woman they believed was Webb with a bullet in the chest. In accordance with Cambodian military procedures, they cremated the body. That night Webb stayed at a friend’s empty apartment, where three hot baths washed the filth from her skin and 15 glasses of iced orange juice finally quenched her thirst. A bed with clean sheets awaited her, but Webb chose the balcony; she missed her hammock. She thought about the soldiers she had nicknamed Dad, Gold Tooth and Mr. Lib, who risked their lives to walk her to safety. Another journalist might have parlayed three weeks of captivity into celebrity status. Webb got back to work instead. For the next three decades, she wrote for wire services from Cambodia, Sri Lanka, Afghanistan, Indonesia, Korea, Hong Kong, the Philippines and India, living outside the usual expat neighborhoods, learning the languages, outreporting many of her younger colleagues and using her own modest income to supplement the salaries of in-country wire-service staff. When she finally retired from front-line reporting at age 58, she returned to Australia, where her family had lived since leaving New Zealand when she was a child. There, she tended her garden and sketched nature scenes. And on some nights, with a cigarette in one hand and a beer in the other, and a rapt audience of friends and family, she told stories about a few of the places she had seen. Well done: KFCH and QSR Brands managing director Jamaludin Md Ali (second from right) handing over the World Hunger Relief cheque to Muhammed Ali. Looking on are KFHC and QSR Brands deputy chairman Ahamad Mohamad (left) and KFC and Pizza Hut divisions president S.K Wong. 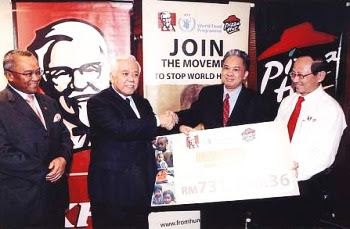 A TOTAL of RM731,396 (Malaysian Ringgit) was raised for the United Nations World Food Programme (WFP) and local charities in a fund-raising drive held by KFC Malaysia, Singapore, Brunei and Cambodia, and Pizza Hut Malaysia and Singapore recently. The drive was launched by Raja Zarith Sofia Sultan Idris Shah, the consort of the Tengku Mahkota of Johor, at Persada Johor Interna-tional Convention Centre on Oct 2. The drive was held in conjunction with World Hunger Relief Week that was observed worldwide from Oct 14 to 20 this year. It was organised by Yum! Brands in partnership with WFP, the UN’s frontline agency in the fight against hunger. Malaysia raised RM571,772, of which RM457,418 was channelled to the WFP and RM114,354 donated to local charities. Singapore raised RM159,624, all of which was channelled to WFP. The money contributed to WFP will be spent on hunger relief work in Third World countries, mainly in Africa, Asia and Latin America. “I am pleased that we exceeded our initial target of RM600,000,” said Tan Sri Muhammad Ali Hashim, chairman of QSR Brands Bhd and KFC Holdings (Malaysia) Bhd, operators of Pizza Hut and KFC respectively. “I wish to thank our staff for their hard work in the fund-raising drive and members of the public for their generosity and support,” he added. Globally, the campaign was a one-week in-restaurant, system-wide promotion by Yum! Brands to raise awareness, volunteerism and funds to combat hunger around the world. KFC and Pizza Hut Malaysia and Singapore, however, launched it early to coincide with Ramadan and Hari Raya Aidilfitri and extended it for a month. More than 660 restaurants and 21,000 employees in Malaysia, Singapore, Brunei and Cambodia were mobilised in the effort. Bookmarks and postcards were produced and sold at all KFC and Pizza Hut restaurants and their restaurant support centre to raise funds. Collection boxes were also placed in all restaurants for customers to donate money. WFP is the world’s largest humanitarian agency providing food and resources to build self-sustaining communities in the most impoverished corners of the world. A Biograhy of Prince Norodom Chantaraingsey- part two (B). This is the second of a four-part series of a biography of Prince Norodom Chantaraingsey. This biography was compiled by Mr. Hass Savoeun, a member of the Buddhist Khmer Center in the USA (http://www.ibuddhi.org/about.php) and was republished in the website of the Khmer Center in Switzerland, adding the front page picture by Lok Ly Diep of Angkor Borei News in the USA. The biography is translated from Khmer to English by Khmerization. 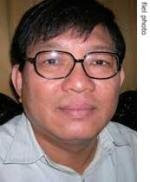 Previously I cited Mr. Hass Savoeun as a member of Khmer Center in Switzerland. He is in fact a member of the Buddhist Khmer Center in the USA. I wish to thank Lok Perom Uch for bringing to my attention about my erroneous citations. I thank him for his correction and wish to apologise to all concerned for my errors. In order to expand their territories the Committee had divided the movement and their military wings into small autonomous groups and sent them out to liberate more territories from south up to north of the country. This approach reflected Dap Chhuon’s cautious policy. Fearing that his powerful position can be taken over any time by his other more educated colleagues he devised a plan to kick them out of his group. After the attack on Siem Reap he sent all those who were more competent and able than him to work far away from him. And as a result those whom he virtually kicked out decided not to rejoin the Committee and formed their own splintered groups in the new territories. A. The Committee for the Khmer National Salvation Chapter Two. Due to Dap Chhuon’s paranoid actions, immediately after the attack on Siem Reap, another group had retreated to set up their base at Puok district and formed “ the Committee for the Khmer National Salvation Chapter Two” there. This group was led by Achar Tum which was under the indirect control of Leav Keo Moni but still maintained a relationship Dap Chhuon’s group and also with the arms supply group in Bangkok as well. B. The Committee for the Khmer National Salvation Chapter Three. Another group that the Committee for the Khmer National Salvation Chapter One sent to expand the territory in Battambang had decided to create the “Committee for the Khmer National Salvation Chapter Three” and based themselves at Banon in Battambang and was led by Ouch Nilpich as the leader and Ta Lay Jayamongkol as his deputy who based his group at Prek Trop, along the Tonle Sap Lake. C. The Committee for the Khmer National Salvation Chapter Three. Another group with about 30 fighters under the leadership of Prince Chantaraingsey was sent by Dap Chhuon to Tbaung Khmum (Kampong Cham) to carry out sabotage against the enemy’s economy by destroying rubber plantations there. This group included other such important leaders as Hem Savang, Him Khan, Chan Tor Tress and Sok Seng Roeung Mony. This group had travelled through provinces which located along the Tonle Sap Lake by crossing the Lake between Kampong Chnang and Kampong Luong-Ponhea Leu district but due to heavy and active patrols by the French troops the Prince decided not to cross the Lake from the east. The Prince then decided to lead his troops back to the foot of the Dangrek Mountain Ranges and then led his troops detour to Ormlaing, Roleak Cheung, Kantel Reussey Chum and Veal Veng near the border with Trat province of Thailand. After establishing and strengthening his power base there the Prince declared the formation of the “Committee for the Khmer National Salvation Chapter Four” at around the end of 1949. This group’s logo was a red flag with the yellow picture of a three-towered Angkor Wat in the middle, exactly the same as the flag of the Committee for the Khmer National Salvation Chapter One as well. Due to Prince Chantaraingsey having a political leaning toward the republican regime and due to his dislike of the monarchy, the top end and the bottom end of the picture of Angkor Wat did not have the blue stripes in the middle. Since he set up his base at Ormlaing he had military successes one after the other and his name and reputation had become increasingly well known. Due to the help from a group led by a man called Seap, the Prince was able to expand his territory in the south to the future National Route four, adjoining with the territory of the Committee for the Khmer National Salvation Chapter Five. On the western side his territory expanded to Sre Ambel and Koh Kong province. On the northern side it expanded to Veal Veng and Leach which was bordering with Pursat province. On the eastern side it expanded to Kampong Chnang, which nearly the whole of this province was controlled by Puth Chhay which he expanded south to Thmat Pong Mountain where he based himself there. The zones under the control of Prince Chantaraingsey was administered with a government-like structure, following the political system of a republican regime. The creation of a republic-type administrative structure had angered many prominent people in the group. And this caused rivalry among many leaders in each group to try to influence the Committee which led some to plan a party coup d’etat. 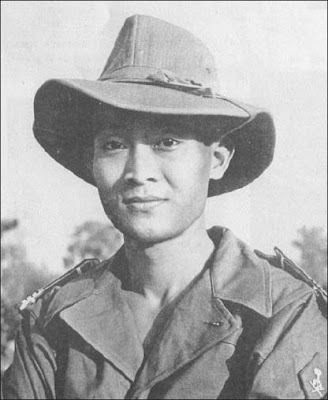 Prince Chantaraingsey had also led an attack on Siem Reap on the 7th August 1946 and after that he led his troops to set up a base at Ormlaing where he established his name and reputation as a competent leader. E. The Committee for the Khmer National Salvation Chapter Five. This is a group with hundreds of followers which was led by Leav Keo Moni and Kao Tak. After Dap Chhuon had re-integrated with the government this group appointed a military officer named Hiv Thinh, who was a military officer of the First Batch, who had set up his base at Phnom Srong, as their military commander. Later Hiv Thinh was murdered by Puth Chhay, who was an Issarak leader from another group. So another Issarak military commander named Savang Vong, who was also a military officer of the First Batch, took over the position of the commander of the military wing of the “Committee for the Khmer National Salvation Chapter Five”. We knew how big the territory was controlled by this group. But on the southern and the northern sides of this group’s territory it was under the control of Son Ngoc Thanh’s group…//(To be continued in parts 3 and 4). To read part three click here. Bhutto supporters surround leader's dead body in ambulance upon arrival for burial at her ancestral grave yard in Gari Khuda Bux, 28 Dec 2007. Hundreds of thousands of Pakistanis crowded an emotional funeral Friday for assassinated former Prime Minister Benazir Bhutto. Throngs of people lined the streets as the coffin holding Ms. Bhutto's body was taken to her final resting place and lowered into a grave next to her father at the family mausoleum in southern Sindh province. Angry Bhutto supporters continued street protests Friday - attacking police stations and government offices, and torching cars. At least 23 people have died since Ms. Bhutto was killed on Thursday. Most of the violence was in Sindh province, Ms. Bhutto's home and political stronghold. Officials there have issued "shoot to kill" orders against violent protesters. The 54-year-old opposition leader was assassinated Thursday in Rawalpindi as she left a political rally - part of her campaign for parliamentary elections set for January 8. Pakistan's caretaker Prime Minister, Mohammadmian Soomro, said Friday, the government has no immediate plans to postpone the vote. Opposition leader and former Prime Minister Nawaz Sharif says his party the Pakistan Muslim League will boycott the elections. Pakistani President Pervez Musharraf blamed terrorists for the attack against Ms. Bhutto. He declared three days of mourning and called for calm. Ms. Bhutto was in an armored car at the moment of Thursday's attack, but was exposed, standing up in the sunroof and waving to her supporters. Police say a suicide bomber fired shots at Ms. Bhutto, then blew himself up, killing at least 20 people. Just two months ago she narrowly escaped a double suicide bombing targeting her homecoming in Karachi hours after she returned to Pakistan, ending eight years of self-imposed exile. Around 140 people were killed and Ms. Bhutto demanded the Musharraf government beef up her security. “By not revealing the name, speaking toward an unnamed person who had initiated ‘dying of color’ [hinting but not revealing] over an [also unnamed] spy, which shocked Khmer citizens in the past few weeks, yesterday Mr. Son Chhay (pictured) demanded the release of related documents. “As for the reaction of this parliamentarian - though the name of the person who threatened that he has clear documents was not mentioned - it can be understood that the threatening person is Hun Sen, the power-addicted Prime Minister of Cambodia. “It seems that all this is a repetition of last week, when Hun Sen, who is a former soldier of the Khmer Rouge which led Cambodia into a hole of death, said that he has documents, voice and video recordings, to show that a person, who now criticizes him of using money secretly to reduce the fuel prices, saying that this is non-transparent, is his spy, and he is even prepared to publish secret documents to prove it. The speech of Hun Sen referred to Mr. Son Chhay. “However, this parliamentarian, who frequently criticizes the government for scandals without hesitation, is not frightened of Hun Sen’s public threat at all. Mr. Son Chhay at this time wants to see the documents related to the insult to him which say that he is a spy. “It should be noticed that on 13 December, in a public forum, Hun Sen said that his government spent $26 million in one year secretly to prevent the increase of electricity prices, and nearly $200 million to prevent the increase of fuel prices - but Mr. Son Chhay said that these are non-transparent activities. “Such an understanding by Hun Sen caused criticism from national and international circles, saying that it is not suitable for a leader of a democratic country - quite to the contrary, it seems to show clearly that this prime minister is leading the country with a dictatorial communist system, because in democratic countries, the leaders always regard their citizens as Heavenly Lord and Master, and all decisions on spending money by the government must be based on an agreement by the parliamentarians as representatives of the citizens in advance; expenses cannot be made quietly like this, because it is money from tax payments, coming from the citizens’ sweat and blood. “Nonetheless, all income and expenses of the government, which is controlled by Hun Sen, are now seen to be handled illegally, depending only on what powerful people say, like Mr. Son Chhay explained that no transparency exits, which shows that those who act like this seriously look down on the citizens who pay taxes. “In order to hide such very bad and non-transparent activities, it is observed that the country’s leader always holds blood in his mouth and spits it on other people [=accusing other people], such as this accusation that this person or that person is planning to oppose him, or that that person is his spy, which is a threat and a strategy to attract and to divert public interest. 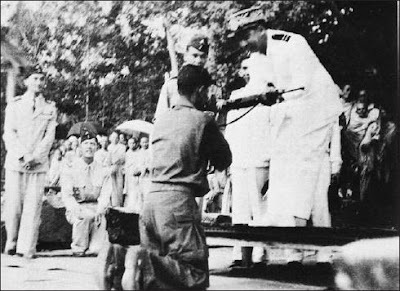 “Moreover, according to a professor of the Royal Academy of Cambodia, this is a bad way which serves the political ambition of a foreign country which is the enemy of Khmer [Cambodia], in order to break up the nation, causing confusion and doubt, and leading to the killing of each other - among Khmers and Khmers. “As for Mr. Son Chhay, he gives the impression that the current situation of Cambodia is not very different from the Khmer Rouge regime. “Mr. Son Chhay said, ‘Cambodia used to be ruled by the dictatorship of the Khmer Rouge group, and though the government affirmed that it had destroyed the political organization of the Khmer Rouge, it is observed that the Khmer Rouge influence still continues. The government of our country is making all citizens frightened because of threats; even to publicly protest as an effort to participate in politics is difficult. ON a six-month backpacking trip around Asia last year, 27-year-old Sydneysider Ainslie Bartlett met two Cambodian monks who ran a local school for poverty-stricken children in Siem Reap.Through these contacts Ainslie ended up as a volunteer teaching English at a school for the children.Ainslie worked closely with the monks, staying in a guest house next to the monastery, eating with them and doing day trips on their Sundays off. For six days a week she helped teach English to the school's 200 children from the surrounding communities.Ainslie says her personal involvement not only gave her a unique travelling experience but changed her outlook on life. "Ever since I came back I've felt like a different and better person," she says.Ainslie is an example of the growing number of Australians choosing to give something back to countries they visit, rather than being what can be seen as stereotypical tourists who care more about five-star hotels than the people, culture and environments they experience.The 27-year-old insurance underwriter "just by chance stumbled across the school", but travel agencies and volunteer organisations all offer a wealth of options for those interested in travelling with a conscience.How about taking a wildlife conservation expedition to the Amazon? Participating for a water conservation project in Kenya? Or lending your skills to help study climate change in the Arctic?And volunteering as an English teacher will take you to just about every corner of the world.The World Bank, which monitors ecotourism and cultural tourism, says these are the fastest-growing segments of the global travel industry. "What we find is people return a third time, a fourth time, a 15th time. They realise this kind of travel is how you really get to see the world and experience more of the food, the culture, the camaraderie," World Bank director Kristalina Georgieva says.Australian Volunteers International says the 700 or more Australians that choose to volunteer with them worked for 4000 hours on 420 assignments last financial year, foregoing $18 million dollars of earning to work overseas.Australian Volunteers International (AVI), which has volunteer options in more than 36 countries, specialises in organising career-specific volunteer trips to places which that are in need of professionals with particular skills, such as accountants, social workers and project officers.STA Travel offers a range of eco and cultural tourism packages, including teaching English in countries like Ghana and Sri Lanka, conservation work in Equador and turtle conservation in Costa Rica. It and even offers travellers a chance to carbon offset their trip.But volunteer holidays don't always come cheap.Some agency-organised trips can set Good Samaritans back thousands of dollars – much more than the cost of travelling around the country on your own.Travellers can be asked to pay not only for their own airfare and accommodation costs, but the opportunity to volunteer.Some travellers, like Ainslie, are concerned that their money may not be going towards the places they visit.She says she'd rather find her own volunteer project and invest her money straight into the community. "I always wanted to do volunteer work or charity work, but when I looked into it there was always a lot of cost involved and it was always in groups and really organised. I just thought it seemed a bit impersonal, not to mention expensive," Ainslie says. "So I just thought I'd go over there and see what I could do. "It's easy to pick up (volunteer work) over there, if it's something you really want to do. "Zayne D'Crus from AVI says trips like Ainslie's can go well, but if they go wrong it pays to be with a volunteer organisation. "We definitely do encourage people who are travelling to try and find volunteer options, and in some cases that works out very well for them," he says. "But I suppose one of the reasons people go through agencies – whether it's ourselves or STA or wherever – is that you have the security of knowing that you're going to be looked after and supported through your assignment if something goes wrong. "Because AVI is funded through the Australian Government's overseas aid program people who volunteer through that program have airfares and accommodation costs looked after. They also receive a living allowance and insurance on a job-by-job basis.AVI's Zayne D'Crus acknowledges that volunteering can be expensive but much of this goes towards administration. "The agencies that put them together often have to do a lot of work initially in setting up the projects, in making sure the organisations that people work for overseas are being adequately supported for the expense of having the volunteers with them," he says.STA says the money goes to the communities and administrative costs for recruiting and organising volunteers. "(The cost) usually includes the accommodation, transfers, most meals, materials for the project, 24-hour support and reps on the ground to ensure all is co-ordinated correctly. "But Ainslie has put her money where her mouth is. Before leaving Cambodia, she raised $700 from her family which paid for new school buildings.They now have three bamboo-thatch classrooms with concrete slabs as floor – and there's enough money to build a toilet block as well. There is now room for 500 at the school.Knowing it takes $5000 a year to run the school, Ainslie is currently fundraising to support it after the death of the school's director, monk Rathana in a tuk tuk vehicle accident earlier this year.Now back in Cambodia, she handed over $4400 – raised by a sponsored fun run and a mufti day at a local school, where she gave a talk on the work the school was doing. "I always promised when I left that I'd return and that I'd always help. And I couldn't not help after the experience I had there," she says. JANESVILLE — The Janesville School District has the second-highest number of Cambodian students in Wisconsin. English Language Learners program support teacher Julie DeCook says many of the Cambodian students have been in her program for a long time. She says many of them are not literate in their first language. DeCook says many of their parents were able to escape Cambodia in the 1970s because they weren't educated. She says one important thing to remember about Cambodians is that they come from a different country than Wisconsin's Hmong population. It appears Cambodian families chose to settle in Janesville when churches sponsored them after the Vietnam War and genocide in Cambodia. President Bush making remarks after Bhutto's assassination by describing the assassination as a cowardlly act by murderous extremists. Leaders from around the world have condemned the assassination of former Pakistan Prime Minister Benazir Bhutto. 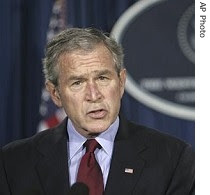 U.S. President George Bush described Benazir Bhutto's assassination as a cowardly act by murderous extremists who are trying to undermine Pakistan's democracy. And he urged the Pakistanis to keep the country on a democratic path. Indian Prime Minister Manmohan Singh said the subcontinent has lost an outstanding leader who worked for democracy and reconciliation in her country. Afghan President Hamid Karzai, who held talks with Ms. Bhutto just hours before she was killed, said he was shocked by the development. Pakistan former PM Benazir Bhutto, right, meets Afghan President Hamid Karzai in Islamabad, 27 Dec 2007"I met with her this morning. I found her to be a very, very brave woman with a clear vision for her country, for Afghanistan and for the region - a vision of democracy and prosperity and peace," he said. Ms. Bhutto was killed in a suicide attack as she left an election rally of her Pakistan's People's Party in the city of Rawalpindi. French President Nicholas Sarkozy called the attack an odious act. And British Foreign Secretary David Milliband urged the Pakistanis to exercise restraint and work for unity. Karl Inderfurth, former Assistant Secretary of State for South Asia Affairs in the Clinton administration, described Ms. Bhutto as a courageous woman. "I attended a small dinner for her in Washington just prior to her return to Pakistan in October and a good part of the conversation that we had then was about her personal safety," he said. "And she was just absolutely determined to go back, even though she knew that there were great risks involved." Inderfurth says Ms. Bhutto represented a part of Pakistan's democratic landscape. "She has been twice prime minister, twice removed as prime minister, there were charges of corruption and in her administration and with her husband who was a Pakistani senator. But you cannot look at Pakistan in any fashion without taking the Bhutto family and of course Benazir Bhutto, into account." Christine Fair, a Pakistan expert with the RAND Corporation, says when talking about Benazir Bhutto, one has to look at what she represented before her death and what she represents from this day onward. Fair says before her assassination, she wasn't terribly revered, widely respected or supported. "Quite the contrary. During her two tenures as prime minister, she disgraced herself, both because her husband has become synonymous with corruption and greed, but she also has numerous court cases scattered across European capitals as well as in Pakistan on various kinds of corruption. Now the Pakistani charges were dropped," said Fair. Fair says with Ms. Bhutto's death, everything has changed. 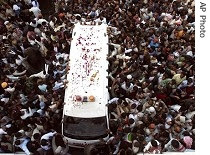 Benazir Bhutto arrives to address her last public rally in Rawalpindi, 27 Dec 2007"Now, of course, today - she's a martyr. She's a martyr for politics in Pakistan and she's a martyr for women. Women have borne the brunt of the Islamization of Pakistan," she added. 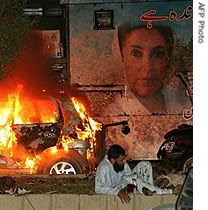 Ms. Bhutto was killed as she campaigned for national elections scheduled January 8. Fair says Pakistani president Pervez Musharraf needs those elections to be seen as free and fair. "To sort of legitimize what he's done over the last several years and to provide him with political cover to continue on as president with or without,obviously without, his uniform. So I think it is going to be impossible now for Musharraf to legitimize himself and his government in what he'd like to do. I think increasingly calls from an expanding number of quarters are going to be demanding that Musharraf go," added Christine Fair. That, says Fair is, going to place those countries who have supported Mr. Musharraf - such as the United States - in a bind. Because in Fair's view, these countries have no plans in place if Pervez Musharraf were to leave the Pakistani political scene.